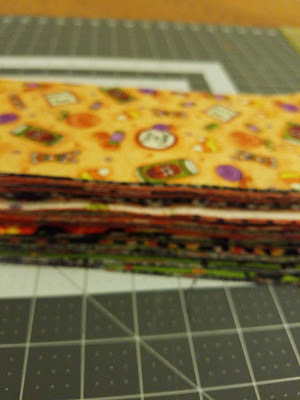 This is funny was going though old blog posts and found that I created this post long ago and never posted it since I finished the binding yesterday on these I thought I should share this. yes we have many ore then the first 3 to finish they are just the start. Any way below is what I wrote a year ago when I first started these. Tanya has us off making new projects again. This time we are trying to get ahead of the game. Meaning that we will start making things for a holiday before the holiday is over. 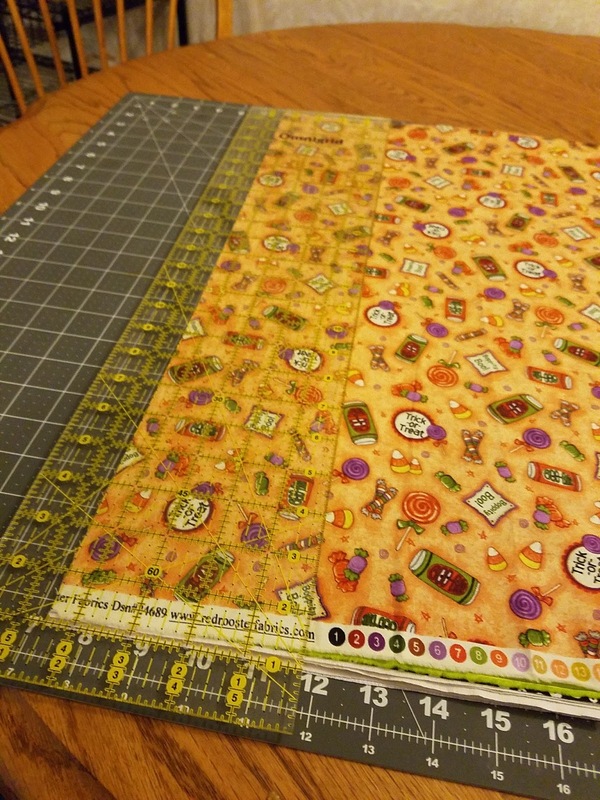 My task to make 10+ Halloween table runners. Kind of a blurry picture but above you can see my nearly 2 inch tall stack of strips. To give context to their size its 4 1/2 inches wide. I do not ever make one thing at a time. Its more like a dozen projects started at a time. One day I am going to have to catalog all the 1/3 way projects I have done in the past. Well we didn't get any of them done by Halloween. Three tops were completed. On to the next season. Good for you for starting early. Maybe this year with the head start, you will have these ready by Halloween. I have Halloween placemats and table runners, just waiting to be quilted. I made them many many years ago. Two posts in a row! Bonanaza! LOL Maybe you'll finish the other seven in time for the holiday this year? Somewhere I still have all the fabric I collected to make a Halloween-in-a-Jar quilt!